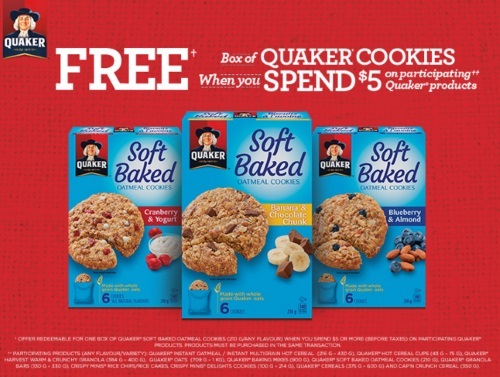 Claim your coupon for a Free Box of Quaker Soft Baked Cookies! This offer is available when you spend $5 or more on participating Quaker products! Participating products include: Quaker Instant Oatmeal / Instant Multigrain Hot Cereal (216g-430g), Quaker Hot Cereal Cups (43-75g), Quaker Harvest Warm & Crunchy Granola (384g-400g), Quaker Oats (709g-1kg), Quaker Baking Mixes (900g), Quaker Soft Baked Oatmeal (210g), Quaker Granola Bars (130g-330g), Crispy Minis Rice Chips/Rice Cakes, Crispy Minis Delights Cookies (100g-214g), Quaker Cereals (375g-600g) and Cap’N Crunch Cereal (350g). All the products must be purchased in the same transaction.